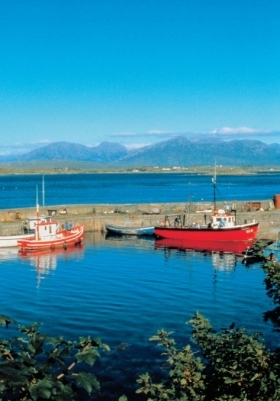 Co. Galway (pronounced gall-way, not gal-way) is one of those places that you can get lost in and never come back. 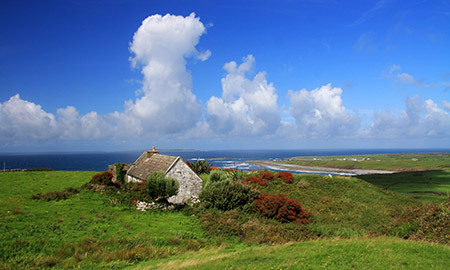 Stretching across one of the most harshly beautiful parts of the west coast of Ireland, Galway's distinctly Irish character comes across in its stark landscapes and rugged beaches, which are contrasted by the warm character of the Galwegian people. 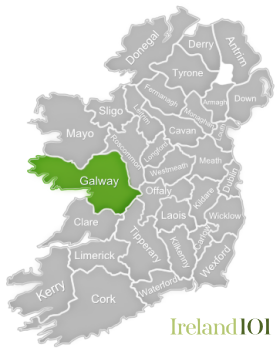 The county was named for its county town, Galway City, a notoriously artistic (read: hippy dippy) place. 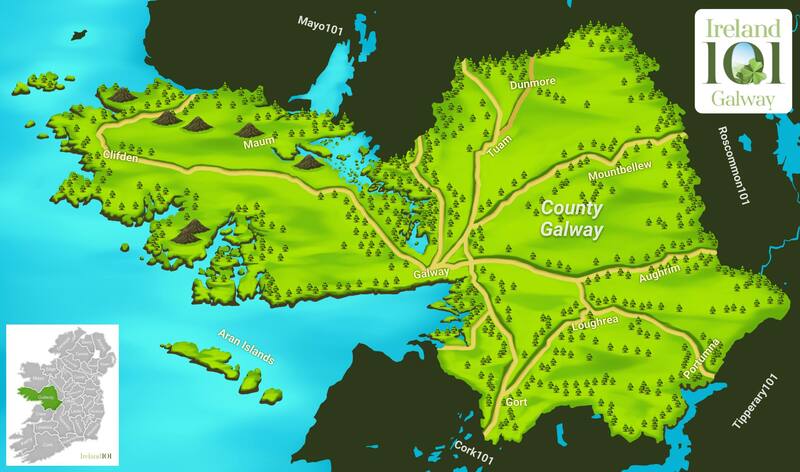 Small and walkable, Galway City has numerous artisanal cafes, local boutiques and quaint pubs, such as Tig Cóilí and the Crane, where music spills out onto the streets (and, sometimes, so do the drunk college students from NUI Galway). 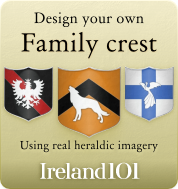 The north part of Co. Galway is easily its most distinguishing region. 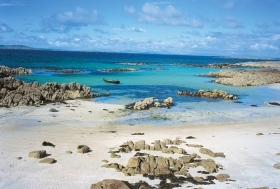 Connemara is a rugged landscape marked by barren mountains, including the 12 Bens range, glassy lakes and sea air so fresh it stings your lungs. 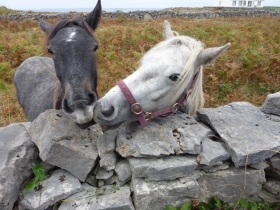 The best place to get a feel for the place is by hiking in Connemara National Park, which is also home to the county's native Connemara ponies. 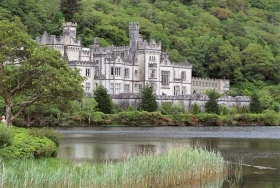 Just down the road, Kylemore Abbey, a 19th century Benedictine monastery, is one of the most beautiful structures in Ireland. 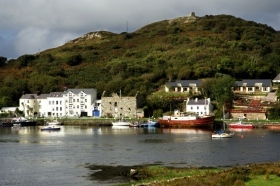 Connemara also comprises the largest Gaeltacht (Irish speaking) region in all of Ireland, with some 45,000 people, and this has given rise to a plethora of Irish language services coming out of Galway, including schools, a radio station (Raidió na Gaeltachta), a TV channel (TG4) and a newspaper (Foinse), all in Irish. 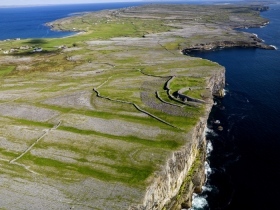 Music and the arts are a way of life in Galway, with the Arts Festival and Early Music Festival held annually, while the Galway Oyster Festival each September is a good time to sample fresh seafood paired with Guinness. 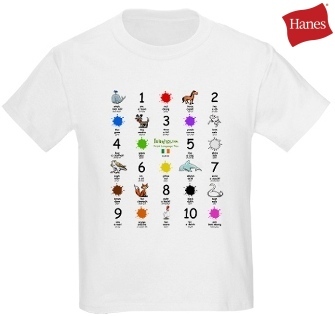 Likewise, the rich and posh come from all over Ireland each July to the Galway Races, where they wear funny hats and pretend to be British while watching horse races. 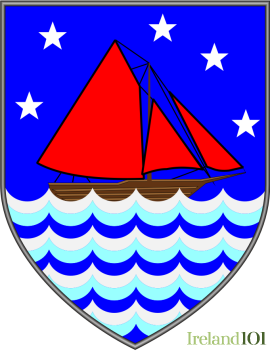 Technically, the most famous thing to come out of Galway was James Joyce's wife, Nora Barnacle. 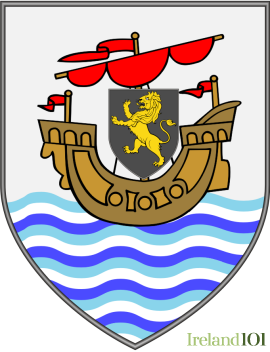 However, everyone knows that Galway's real contribution to Irish society is that great Steve Earle song, Galway Girl, which is featured on the Bulmers ads. 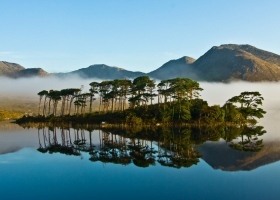 Pine trees island on Derryclare Lake with Twelve Bens in background. 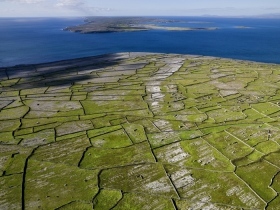 The three Aran Islands, Inis Mór Island (Big Island), Inis Meáin Island (Middle island) and Inis Oírr Island (East island) are situated in a north westerly, south easterly direction. 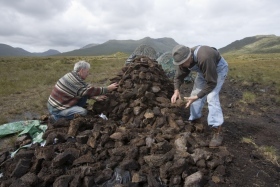 Two men harvesting turf near Leenaun, Galway. 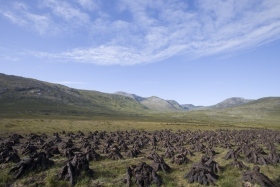 Turf, known also as peat, is partially decomposed vegetable matter that locals use as a cheap (free) source of fuel for home heat. 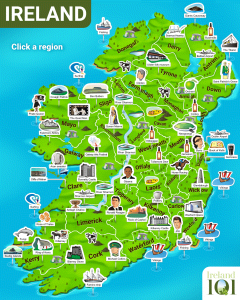 How much do you know about Galway ?